Walk strong during UW Walk Week! Posted on March 19, 2018 by Anna Tegelberg. This entry was posted in Being Active, Staying Healthy, Whole U Program Information and tagged Being Active, uw walk week. Bookmark the permalink. What if there was something you could do for 30 minutes a day that was guaranteed to leave you feeling more energized, awake, and engaged—not to mention healthier? There is: walking! Walking’s benefits include improved balance and coordination and stronger bones and muscles. With spring weather and the UW cherry blossoms in bloom, there’s no better time to get out and get moving. That’s why we’re thrilled to be kicking off spring quarter with UW Walk Week April 2-6, sponsored by UW Medicine and KIND bars! 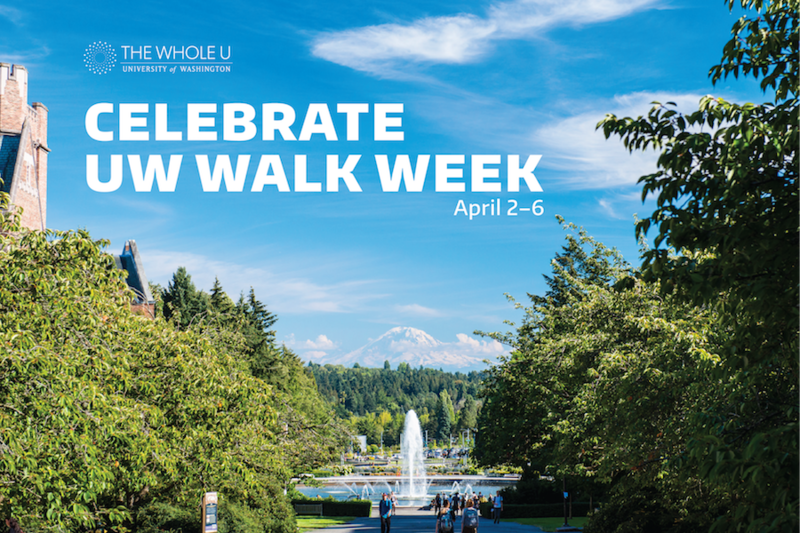 However and with whomever you choose to move, share your experiences with us by submitting photos of your walks to wholeu@uw.edu or post them to social media using the hashtag #uwwalkweek and tag us @UWWholeU on Twitter and @whole U on Instagram. All who register and submit a photo will receive a FREE prize, with special prizes for the most creative and compelling shots (and the stories behind them). We can’t wait to see where you go! During last year’s Walk Week we walked more than 2,200 miles—sign up today and let’s see how far we can get in 2018! Whether you walk to work, at lunch, with your team, or at home, it’s getting out there that counts. You’ll soon begin to feel the benefits that walking at least 30 minutes a day brings to multiple areas of life. Walking is about more than physical fitness. UW Walk Week is an opportunity to step out of the office with coworkers and Whole U ambassadors to make new connections, share in discoveries, enliven the mind, and energize the spirit.